Ever been in a meeting where you felt like you couldn’t get a word in edgewise because your male colleague wouldn’t shut up? Well, now a handy new tool will equip you with receipts when he’s denied that he’s been monologuing about Swingers for 35 minutes straight. 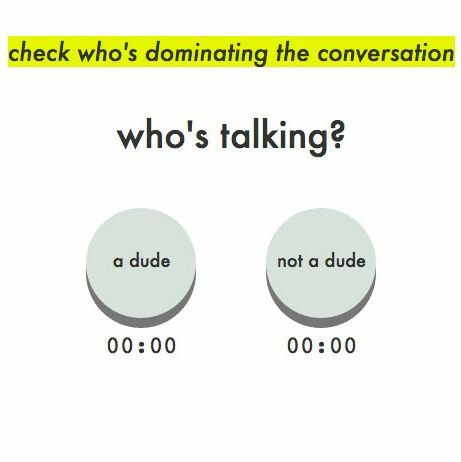 Are Men Talking Too Much, a new site from developer Cathy Deng, features two buttons labeled “a dude” and “not a dude.” Alternate between pressing the buttons depending on the gender of whoever is talking at any giving moment — as time passes, the site will tell you the total percent of time a man has been talking during the conversation. As a bonus, Are Men Talking Too Much matches perfectly with your pay-gap clock.